Tom Peters is a composer and GRAMMY® nominated performer, performing with the Long Beach Symphony Orchestra since 1993 and Southwest Chamber Music since 1998. He has performed as a soloist with Ensemble Oh-Ton, People Inside Electronics, MicroFest, and the Schindler House and many others, and has been featured on Nordwest Radio in Hamburg, Germany. Tom specializes in creating music for silent films, performing original scores through interactive electronics and synchronized electronic soundscapes. 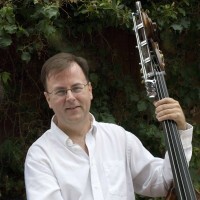 In April 2013, he premiered his original score to the 1927 silent classic The Passion of Joan of Arc—his ninth film—at the Toronto Silent Film Festival with Joelle Morton on tenor viol. The score was featured in a radio broadcast over the CBC. His latest score to John Ford’s classic western The Iron Horse (1924) will be premiered at The Autry National Center in Los Angeles in March 2015. Tom’s 2014 GRAMMY® nominated recording of John Cage’s The 10,000 Things on the MicroFest label with acclaimed pianists Aron Kallay and Vicki Ray, legendary percussionist William Winant, and a recently discovered recording of John Cage himself performing 45’ for a Speaker was the first American recording of this seminal work. Tom is also a prolific writer and is the Aspie of The Aspie and the NT. This blog, written together with his wife Linda, documents his life on the autism spectrum as someone diagnosed with Asperger’s Syndrome and its effect on their relationship. Tom is on the faculty of the Bob Cole Conservatory of Music at the California State University, Long Beach.